After spending seven months in costly research, the Air Force scientific board investigating the F-22 life support system failure has turned in their conclusions. The findings: they have no idea about what's going on. The USAF's press release reads like a joke to American taxpayers. The investigation board, lead by retired General Gregory Martin—aviator and former commander of two major commands—went through each of the 14 physiological incidents in the F-22 fleet. Those incidents led to the grounding all of the 187 $150 million aircraft multiple times. We were unable to determine a root cause, but we were able to put in place the proper safety measures and risk mitigation techniques that would allow the F-22 fleet to return to fly...to ensure the integrity of the life support system. Translation: we don't have a clue about what's happening, but we think these patches may solve whatever the hell this is. The USAF claims that their 14 recommendations will stop the problem from happening again. These recommendations are related to "the acquisition processes and policies, the organizational structure recommendations and equipment recommendations to not only protect the pilots and crew members today but also for the future." It sounds like the USAF will need to spend more money in new equipment to solve something they don't clearly know about. Something fundamental to the plane like the life support system, which should have been working flawlessly for years now. More money to burn in a plane that has never seen combat. Buyer&apos;s Remorse: How Much Has the F-22 Really Cost? The Air Force is well into the implementation phase of the recommendations from the SAB team and continues to aggressively pursue the root cause of these unexplained incidents [Maj. Gen. Charles Lyon, Air Combat Command Director of Operations] said. We have taken a 9-1-1 call approach. We have instructed and talked to our members in the field; whenever you get any indication that something may not be right, knock it off, the flying equivalent of calling 9-1-1 and terminate the flight. All eyes are focused on you and the safe recovery of your aircraft. When a physiological event occurs, the pilot is met by a medical team to care for the pilot and take additional tests and send the tests to the lab, and so far nothing remarkable has come back from the lab tests we've analyzed, he said. Translation: we are flying these birds and keeping our eyes open, praying that nothing else happens. And if i does, we will ground the plane and try to solve it. Yet, Major General Noel "Tom" Jones, Air Force Deputy Chief of Staff for Operations, Plans and Requirements, has the guts to declare that "this aircraft is the world's most advanced aircraft and does air superiority mission unlike any other aircraft in the world. 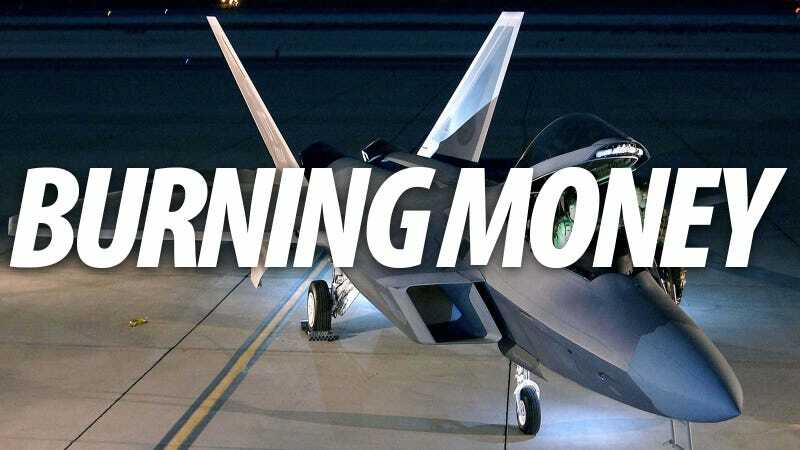 This is the leading edge of technology, and if our nation needs a capability to enter contested airspace to deal with air forces that are trying to deny our forces the ability to maneuver without prejudice on the ground; it will be the F-22 that takes on that mission." Perhaps the General has a different idea of what is the "world's most advanced aircraft." While the F-22 is an amazing plane, it's not going to be very useful if the oxygen supply fails in the middle of a combat. If it ever flies in combat, that is.